Home - How should Cambodia respond to external pressures? Cambodia has been the contesting ground of major powers and now it seems to be the beginning for a new Cold War provoked by some Western countries as they ignore the realities in the Kingdom. Most of Western policymakers and analysts have outdated views on Cambodia. How can they analyse the Cambodian issue without talking to Cambodian stakeholders in the country? As of such, how much reliable data do they have to make objective and credible assessments? Now, the majority of Cambodians have spoken freely by exercising their political rights through the ballot box and not through revolution or violence. Over 80 percent of registered voters cast their votes last Sunday in a peaceful environment. Rather than sending encouraging messages, some Western countries have called the election “flawed”, “a sham”, and “not free and fair”. The question is how come a country can make comments on another country’s election if it does not send its own observers to scrutinise the electoral process. Over 200 international observers from more than 50 countries have issued statements on the election. Their assessments are more legitimate than the statements of those who did not directly observe the election. Of course, the electoral process was not perfect and there were some setbacks due to the small number of poll scrutineers on voting day from the political parties themselves. That, however, was based on the capacity and resources of individual parties and blame should not be heaped on the National Election Committee. According to preliminary NEC results, there were close to 600,000 invalid votes cast on Sunday, or about 9.2 percent of the registered voters – which was higher than the 2013 election. There are two explanations for this. Firstly, it was deliberate spoiling of votes – meaning voters did not want to choose any political party from the list. Secondly, it was unintended spoilage – where voters did not tick the boxes correctly, attributed, of course, to lack of voter education. Nonetheless, we could assume that the majority of invalid votes were for the outlawed CNRP opposition. Combining the invalid votes and the number of voters that did not turn up on Sunday (18 percent of registered voters), the rate is about 27 percent of total registered voters of 8.3 million which is about 2.2 million votes. Let’s generously assume that those votes were protest ones for the outlawed CNRP. 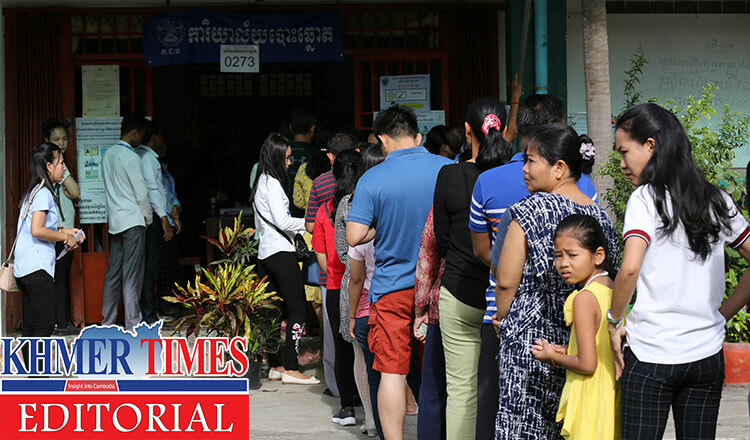 We could assume that the majority of the invalid votes are the votes for the outlawed opposition party as it is mostly in provinces where the former CNRP had made major inroads in 2013. However, it’s still far behind the Cambodian People’s Party (CPP) which received over 4.8 million votes. So, it is crystal clear that the CPP has earned its legitimacy and mandate from the people. In fact, if critics were to be objective and put aside past biases, it’s apparent that the Cambodian people have spoken through Sunday’s election and embraced democratic principles of the 1991 Paris Peace Accords that enshrines the ballot box as the only legitimate way to choose a government. If the people truly wanted, like what recently happened in Malaysia, they would have voted out the ruling party even if there was any intimidation. The spoiled votes give credence to this argument. It is also clear that had these spoilt votes been cast for the opposition parties contesting, quite a few could have won seats and be constructive players in the National Assembly. Unfortunately, that wasn’t the case due to the selfish interests of the outlawed CNRP and the fugitive self-exiled Sam Rainsy who are still conniving and scheming to be relevant players in the Kingdom’s political system, and will stop at nothing to achieve that. The outlawed CNRP have very arrogantly put forward that they are the “one and only opposition” in the country and all others are just “flies on the wall”. From a legal and technical point of view, the election was free and fair. So why are certain Western countries saying the opposite? Cleary, there is a geopolitical agenda behind that. The main interests of those countries, condemning Sunday’s election, are to orchestrate regime change in Cambodia through people’s uprising and to thwart China’s influence and presence in the country and the region. So, if it is more a political and geopolitical question, how should Cambodia respond? Firstly, Cambodia must by all means show it has alternatives. Within the context of pluralism of power, Cambodia has choices to align itself with other major powers. 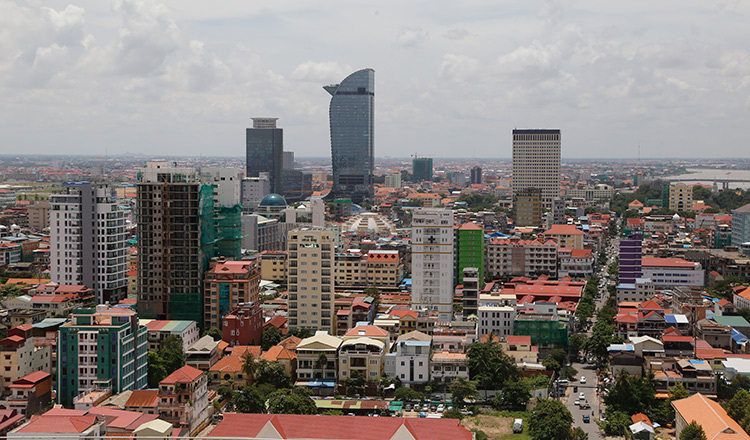 The more pressure there is from the West, the more opportunities there will be for Cambodia to diversify its economic and strategic partners – from the West to the East and beyond. Most importantly, Cambodia needs to diversify its export markets from the US and the EU to other parts of the world and transform its economy, currently heavily reliant on labour (particularly the textile industry), to a knowledge-based economy. External pressures from the West will force Cambodia to diversify its economic partners and sources of growth. Secondly, Cambodia must show that it is not a client state of any country. Diversification and hedging strategy helps Cambodia to stay independent from foreign interference. Asean is the most important regional organisation that can help Cambodia to stay neutral and independent from great power politics and interventions. Strengthening Asean unity and centrality tremendously helps Cambodia’s foreign policy autonomy. As previously mentioned, in terms of foreign policy, the future government must further diversify and strengthen its strategic partnerships with major and middle powers. From relying or leaning only towards China and Japan as strategic partners, Cambodia should consider exploring strategic geopolitical and trade partnerships with Russia, India, South Korea, Indonesia, and Australia. More ties with institutions such as the Customs Union trade bloc led by Russia and comprising Moldova, Georgia, Armenia, Ukraine, Belarus and Azerbaijan and Eurasian Economic Union will help Cambodia diversify its trade partners and opportunities as well as lean on the common strength these blocs bring, to help strengthen Cambodia’s case internationally. Thirdly, Cambodia must strengthen the capacity of its diplomats. Cambodia urgently needs reforms on two fronts: domestically and in its foreign policy. Diplomacy and foreign policy will be one of the top challenges of the new government. Therefore, meritocracy and capacity building need to be on the top list of priorities. There is a serious lack of geopolitical analysis coming into Phnom Penh from Cambodia’s foreign missions due to a lack of experts in the field. Most of Cambodian diplomats are concerned about protocol and coordination with their foreign country counterparts than working on geopolitical analysis and foreign policy proposals. Research capacity at the Ministry of Foreign Affairs and International Cooperation is very limited and the budget for R&D across government ministries is miniscule. Amidst pressures from some Western countries, Cambodia must strengthen its national unity, promote robust reforms, and develop a new generation of career diplomats who can steer the Kingdom through turbulent and uncertain times. Diversification and hedging strategy should be the guiding principle of Cambodia’s foreign policy. The future of Cambodia will be determined by the Cambodian people themselves as long as they stay united and work together to realise common national interests. Nothing is more valuable than independence and self-determination. Cambodia is a country for all and at this crucial juncture in time, it is in no one’s interest to indulge in political brinkmanship to undermine national unity. The Kingdom has an inclusive foreign policy and is open to build friendship with all countries as long as mutual respect and mutual interests are guaranteed. A positive move forward is for the United States and European Union to try engaging Cambodia instead of resorting to subtle isolationism. By trying to isolate Cambodia with sanctions of any form, will only serve to further push the country to strengthen its ties with the East.